One family that LSR has been supporting with housing, food and financial assistance for the past nine months has relocated to Andorra where they were welcomed with employment, an apartment and, most important, a residence permit. LSR members in Montagnac generously provided them with free housing in their studio apartment all of this time while another couple devoted endless hours as their LSR sponsors, helping with documentation, medical needs and serving as much-needed, and appreciated, friends during their stay with us. LSR volunteers transported their few possessions to Andorra for them and were gratified to see the warm welcome they received. Thanks to all of those who contributed to this successful intervention. Another family (of five), supported in donated housing in Pézenas for several months, has now moved into La Cimade housing in Beziers while awaiting a final decision on their request for residence visas. Many thanks to another generous member, who provided the apartment, and to the team from Nizas, who served as sponsors for this family throughout the time they were with us. Through their efforts we were able to keep the older children in their schools in Béziers and enter the younger one in school in Pézenas, provide emergency financial and food support for the family, help them receive needed medical and dental care, complete various forms and dossiers and help in other personal ways to make them feel safe and comfortable. We will continue to help sustain this family in Beziers until their case is settled – which we hope will be soon. A third family (also of five), supported for a long-time with housing in Abeilhan, food, transportation and personal needs has been successful in their application for long-term residence permits. The father now has employment in Beziers and they are preparing for a move to their own apartment there, with quite a lot of furnishings provided by LSR, within the next few weeks. Their sponsors have contributed very heavily to this family both financially and personally taking their children to their hearts, and often into their home. The program we have been operating for almost a year to collect donated furniture and household goods with which to furnish 10 additional refugee (CADA) apartments for our partners La Cimade in Béziers has now ended successfully. 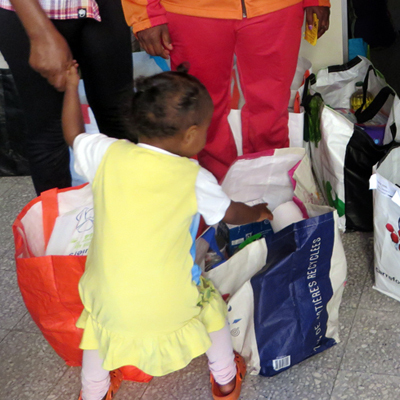 Not only were we able to identify, collect, store and distribute a huge amount of very usable items to La Cimade, but we also have helped four families establish their own apartments in Beziers and wrap up the program with a truckload contribution to Emmaüs. Thanks go to the LSR member who donated her “cave” in Nizas for the storage of these items and to all of those who coordinated the donations, collected the items, sorted, stored, cleaned and delivered them to where they were needed. LSR has, also at the request of La Cimade, been providing emergency food supplies for families arriving to live in the apartments we furnished but who had no allowances with which to feed themselves. This program, which began in April, has also now ended as the families have gradually received the allowances they should have had on arrival. Through the generosity of LSR members, we were able to deliver around 350 bags of food to 15 families who needed it badly. The almost € 2,500 donated especially for this program were used for buying fresh meat and produce to add to the donated food worth at least twice that amount. Thanks to all of you who made it possible to accomplish these things through your direct involvement in them, through your organization of fundraising events to support them and through your general support of LSR. My first draft of this message named many of those who have been key to these accomplishments. My fear of omitting someone or including someone who would prefer to not be named along with my firm belief that whatever any of us do is done, in fact, by all of us, led me to take out all the names. You know who you are. Please be assured that all contributions of time, money, things, ideas and goodwill are fully appreciated. When we all do a little, a lot can get done. Lest this message go on too long, I will stop here, and not start thinking aloud about the opportunities to serve that will arise next.